Many of us are familiar with the plot of West Side Story, the award-winning adaptation of Romeo and Juliet. Set inNew York City in the mid-1950s, the story revolves around the rivalry between the Jets, a white working-class gang, and the Sharks fromPuerto Rico. The rival gangs battle for territory and respect as a romance forms between a Jet and the sister of a Shark. Working off the theme of West Side Story, the U.S. Department of Justice Office of Community Oriented Policing Services (the COPS Office) has created a toolkit to address youth violence and youth-police relations. Schools across the country perform their own adaptations of the class West Side Story every year, so it seems like a great next step to bring these tool kits into schools and communities to help address the issues of gang prevention, youth–police relations, and cultural conflict. For those unfamiliar with the musical, the toolkit not only provides the tools to reduce conflict, solve problems, and build relationships but also the opportunity to experience musical theatre. 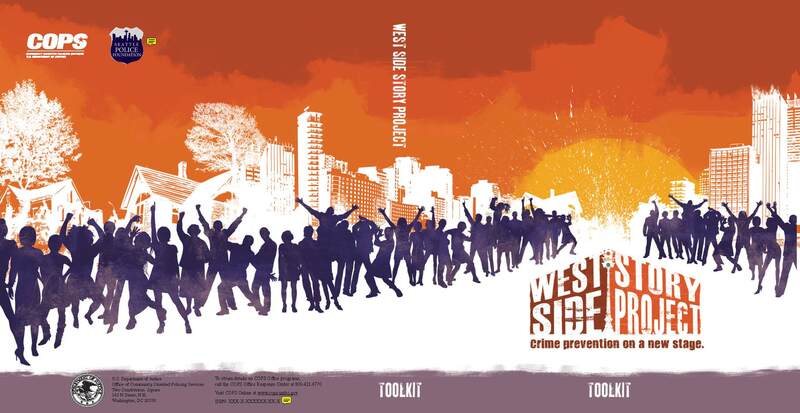 The West Side Story Project Toolkit: Crime Prevention on a New Stage consists of a set of 5 booklets, a CD, and a DVD. Incidentally, GPO’s own Creative Services group designed and developed the toolkit brand/logo and created a kit folder for the training and guidance materials. It’s a great opportunity to get a community involved in collaboration with kids, police, and local arts groups to curb youth-violence and improve youth-police relations, while at the same time introducing live musical theater to those who previously were unacquainted with it. You can get your copy here or find it in a library. This entry was posted on Wednesday, April 20th, 2011 at 9:36 am and is filed under Department of Justice. You can follow any responses to this entry through the RSS 2.0 feed. You can leave a response, or trackback from your own site. AND CONTINUE TO SEND ME THE TOPICS YOU WANT , AS USUAL! “WEST SIDE STORY”!I LIKE THIS STORY!…RIVAL GUNGS , BATTLE FOR TERRITORY …UNTIL …ROMEO AND JULIET!I HAVE NEVER HEARD , AND , I HAVE NEVER SEEN UNFORMAL SITUATION LIKE THIS!I WOULD LIKE TO ADD THIS STORY IN MY FAVORITES!! !IN THE MOST DIFFICULT SITUATION WE MUST TAKE THE POSITIVE SIDE!EVERYTIME , EVERYWHERE!!! Great idea! Forwarded this to my colleague-teaching artists and The Open Eye Theater in The Catskills. Projects like this enrich student experience and encourage creative and innovation which are the building blocks of our future. IS IT FREE OR HOW MUCH IT COST?